This is not Tiki Torch’s first appearance. She actually appeared in a throwaway panel in this strip. I just remember liking the design so much, I wanted to bring it back at least one more time. You can leave comments by clicking here, leave a trackback at http://supervillainous.spiderforest.com/comic/freaky-tiki/trackback/ or subscibe to the RSS Comments Feed for this post. Tiki Torch, I’m sorry, I like you, but you cannot blame people for not being able to tell that you’re a woman. You have no obvious gender characteristics and a fairly masculine appearance. Lots of love for you, but that’s the cost of being a supervillian. Well if you look at where the blue “eyes” are…. I wonder why Gold Skull reacted that way to Crimson Claw? Is CC some sort of social pariah now among the villains? 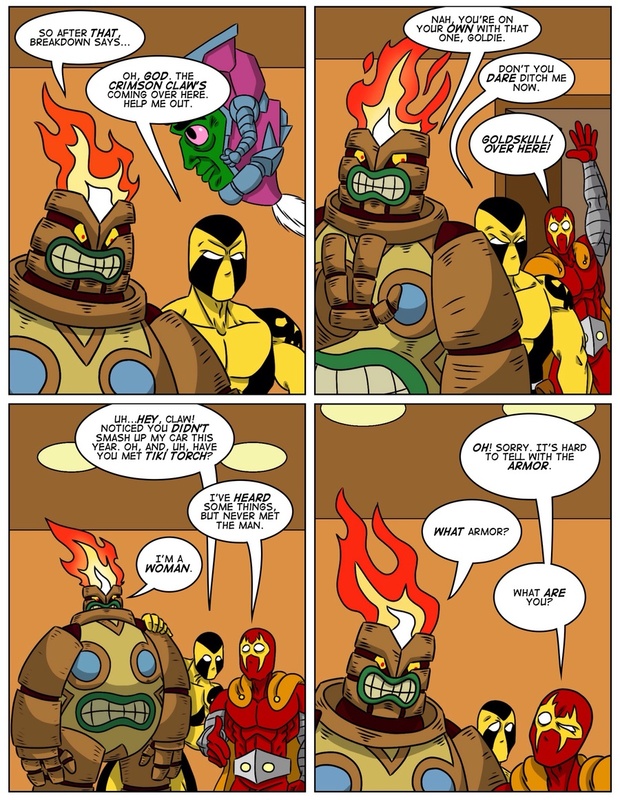 I suppose that it will take some time (or appropriate story events) for Goldskull to come to grips with the fact that… Crimson Claw was pretty much spot on about why you have to be clear when you are taking up the mantle of a preexisting superhero/villain/whatever. Apparently Claw had been a jerk to him for the previous five years but at the same time… it really was a misunderstanding between supervillains (not being dead is actually doing well I’d think =P). Pretty sure it’s like having your car destroyed while at the same time having some extremities painfully removed by mauling. Side note, who the hell thought it was a good idea to sync a person’s nerve receptors to a car so they could feel the damage?! I can see a mech unit but a car? That sounds like distracted driving when trying to outrun people shooting at you kicked up a notch or twelve. It wasn’t that Goldskull hooked up the car to his own nervous system. The car itself had AI that made it capable of feeling pain. I have trouble understanding why Goldskull would have taken such an option, I mean sure, giving an IA the ability to feel pain will enhance it’s self preservation instinct but is that the best course of action for a supervillain car? A car which might be damaged during a car chase? Especially if, when you think about it said damages could be avoided by stopping and letting the cops/heroes arrest the supervillain inside. I’m probably just overthinking the joke. Hey, if you could drive KITT, you’d do it, right? Same thing for Goldskull. Oh, I remember her design! Mostly because the face reminded me of a Mark of Khorne, but whatever works. This actually made me laugh out loud. In the middle of the coffee shop.